Here is a new gadget to try in the water, and it might make you feel like a superhero. It’s called a Flyboard. You put on boots that have thrusters at the bottom which can lift you above the water using water pressure. You also have controls attached to your hands which gush out water allowing you to control your direction. 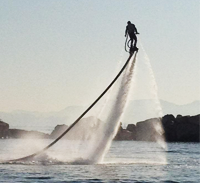 With the Flyboard, you can fly above water or dive into the water like a dolphin. The Flyboard is attached to a jet ski with a big hose.